Adrian Piper - From the series Everything , 2003. Adrian Piper - Everything 21, 2010-2013. Adrian Piper - The Probable Trust Registry: The Rules of the Game # 1-3, 2013. The Biennale is offering his audience, that involves industry specialists and not, the opportunity to explore what is going on in the world through a vast collection of artists coming from five different continents, both in the different Pavilions, dedicated to various countries, as well as in the explorative exhibition that branches out from the Gardens to the Corderie of the Arsenale. 136 are the artists united in the exhibition All the World’s Futures that, according to the curator Okwui Enwezor, will adopt the state of things as the foundation of its restless and explorative project that will sit in a dialectic field of artistic disciplines and references. The main question that will rise from the exhibition will be: in what way can the artists, thinkers, writers, composers, choreographers, singers and musicians unite various audiences, through the use of images, objects, words, movements, actions and sounds, in looking, listening, acting, participating and talking in order to discover the meaning of the upheaval of our time? From the Gardens Pavilion, where on a stage, just like in a theatre, three actors are reading the full version of Das Kapital by Karl Marx, intermitted by traditional songs of the working class, to the Corderie and the outside spaces, the three filters, as so defined by Okwui Enwezor, propose the ever changing parameters: Reding Capital, Garden of Disorder, Liveness, to observe and face the different proposals. Namely the shape or the shapes to make History, from which we all come from, contemporary. If from the past and its ruins we build/deconstruct our future, we can see it in various artists, in their works, in their choice of materials, and from the personal ability of entering into things. The combination of art and life seems to be returning with Okwui Enwezor. The curator, born in Nigeria and raised in the USA, is the only one, together with Swiss Harald Szeemann, to have directed Documenta in Kassel (2002) and the Biennale of Venezia. Writer and visiting professor amongst various American universities, Columbia included, he is one of the major curators of contemporary art, also directing the Bienalle of Joannesburg and the Haus der Kunst in Monaco di Baviera. 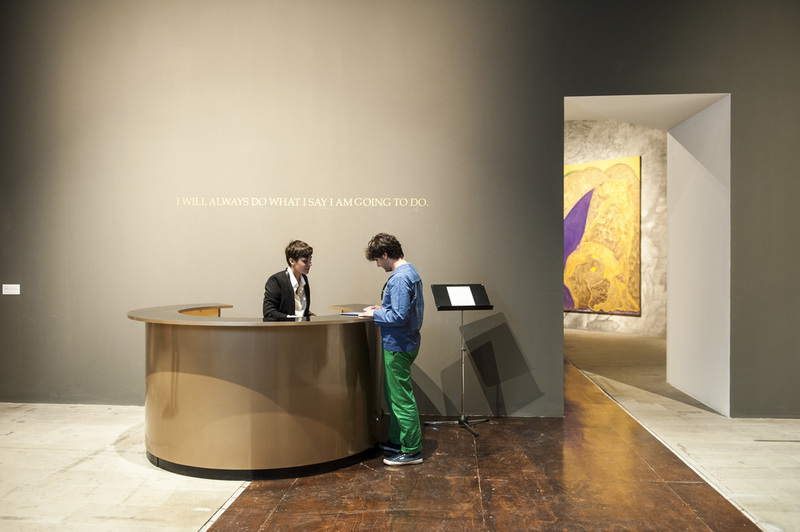 Its from this quote that the curator begins the presentation of the Esposizione Internazionale that sees as a winner of the Leone d’Oro Adrian Piper, protagonist of the current conceptual current and of the performance, being able to mix the artistic practice with academic research. Piper is an analytic philosopher that teaches at Georgetown, Harvard, Stanford and at Wellesley College in Massachusetts. Furthermore she is professor of the American Philosophical Association and the first afro american academic in philosophy. She loves to describe herself as of “mixed race, as all Americans”: she is “for 1/32 from Madagascar, for 1/6 from Nigeria and for 1/8 from east India (Delhi) other than having British and German ancestors.” Scholar of Kant and most of all of metaethics (Rationality and the Structure of the Self, I: The Humean Conception; Rationality and the Structure of the Self, II: A Kantian Conception, Cambridge University Press, 2008), she studied the variety of identities through glances and the behaviour of the other person, the nature of racial problems, physiognomy, the colour of skin, the customs, traditions and discriminations. Another artist that always amazes us for her transgressive energy is Sarah Lucas. Protagonist of the pavilion of the first country that understood that art is fundamental for a civilisation’s progress, she fills the space with photography and sculptures born from the banality of daily life, dealing with issues of sexuality and of sort, pushing them through stereotypes, changing the concepts and painting everything yellow, humorism and surrealism come back thanks to the artistic use of colour. 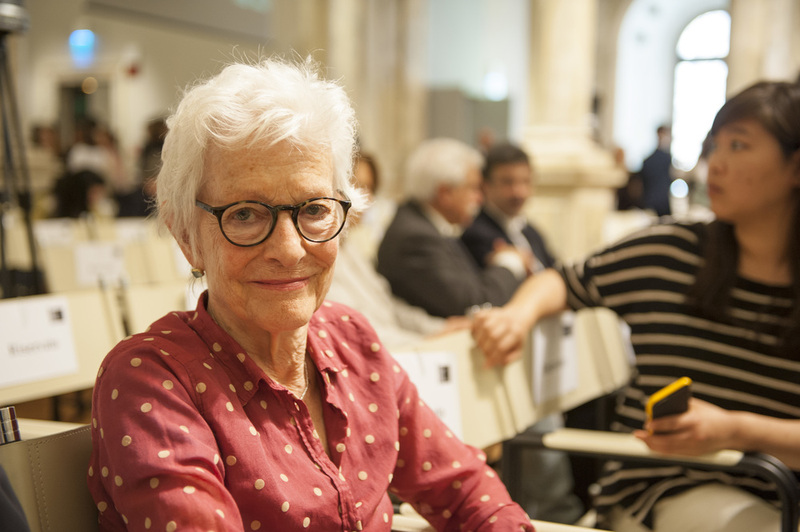 The USA pavilion is entirely set up with the project: They Come To Us Without a World, of Joan Jonas, artist inspired by nature’s spirituality through the texts of Halldor Laxness. 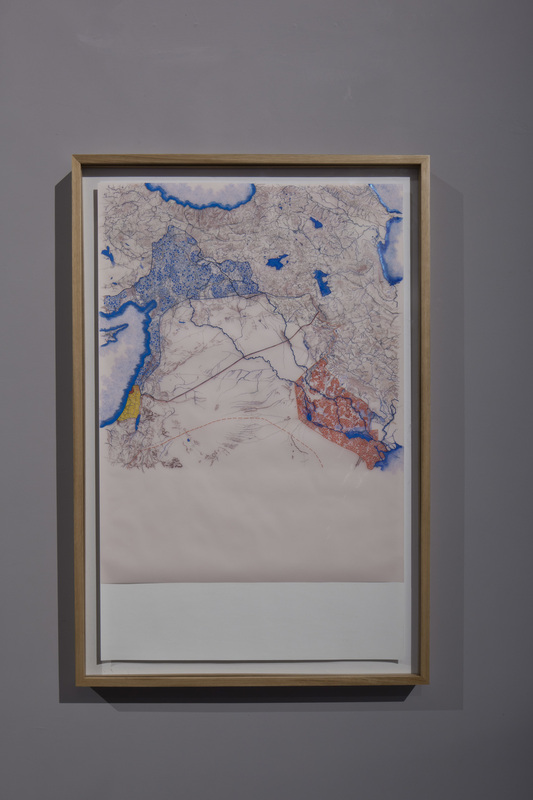 The entire work underlines its fragility, the history, the context, but what really amazes us, other than the images, is the uninterrupted oral narration, integrated by the artist’s performance, created especially for Venice, with music composed by jazz player Jason Moran. In the pavilion of the Nordic Countries, artist Camille Norment includes sculpture, performance and audio. These explore the relationship with the body according to composer Arne Nordheim “the music lives in the space between poetry and catastrophe” and from the catalogue “…the viewer of the pavilion enters a space torn a part by these forces in conflict, in a place suspended between poetry and catastrophe”. Places, shown in maps, also for Tiffany Ching in the Corderie, where she embroiders and paints with enchanting delicacy. Weaves, maps, reminiscent of memories of traumatic events or reconstructions. The strings intertwine and reveal, just how the embroideries on a weave, the facts of life: a geography of history that we have to make a part of us for building our future. We find an eco in the memories of the people in The Key in Hand of Japanese artists Chiharu Shiota. 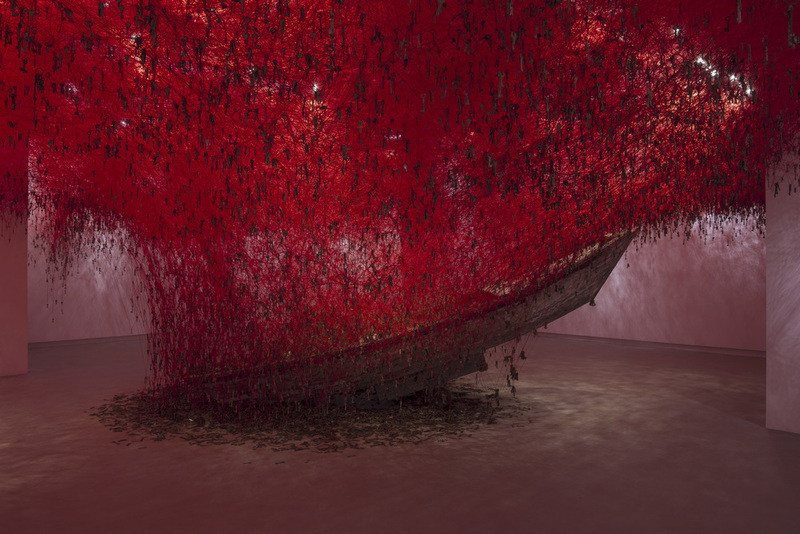 A pavilion painted all in red, with numerous keys dangling from red strings, two white boats, children in a video that are reminiscent of a recent past, theirs: and that is the key. This Biennale is full of emotions, never was the human being represented with such intensity. This event makes us aware that we have to know him in order to love him. If we don’t know ourselves we can’t love us and who is living next to us, even if for a couple of minutes, in a public or private space, ours, that is becoming more and more unstable; but the artists have the great gift of revealing it. The “neomorrisiano” Jeremy Deller, between the revolutionary 19th century and British folk, knows this; as well as Senegalese artist Fatou Kandé and his uninterrupted thread between past, present and future. All of the artists present know it, its up to us to discover it.